May 11th & 12th 2019 in Commercial Building 2, up on the hill at the Deerfield Fairgrounds. We would be glad to accept fiber drop-offs during this time! into beautiful yarn, roving, batts and bumps. Sallie has been in love with natural fibers for as long as she can remember. She is a knitter and long-time hand spinner. She first became interested in alpacas (back in 1994) through working with their beautiful fleece. 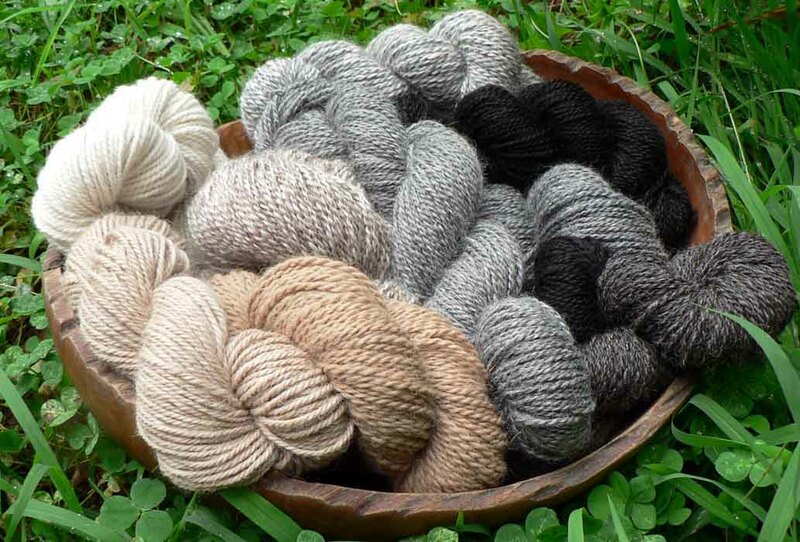 The mill mostly processes alpaca, but also processes other fibers including: wool, mohair, angora, and cashmere. The mill has been operating for 10 years and with time and experience we are better at producing an outstanding product. Each lot is processed according to its own merits. Sallie's skein, mill-spun from fiber from Sallie’s Fen alpaca, Huacho's Sheherazade, received a BLUE RIBBON and score of 98 out of 100 from MAPACA 2008 Fiber Arts Judge Wini Labrecque. At the 2010 MOPACA INVITATIONAL ALPACA SHOW another of Sallie's skeins received a full 100 points out of 100! Roving/batts/bumps please send at least 1 lb of raw fiber. Staple length of fiber must at least 3 in but no longer than 6 in. See ruler on order form. We expect all fleeces to be skirted. 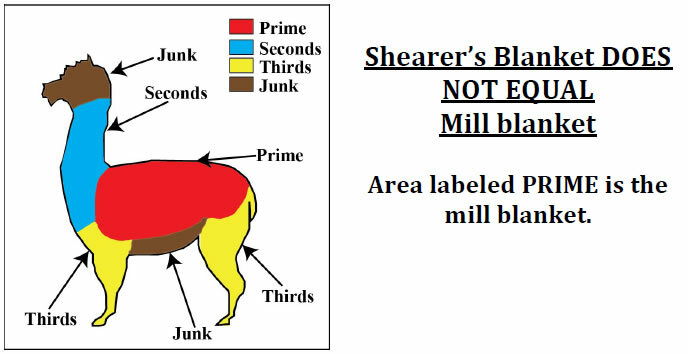 Do NOT send shearer’s ‘blanket’. Please take the time to remove the ‘other’ fiber around the outside of the blanket area. See skirting diagram link above. The feel of the yarn and or roving will be no better than the coarsest fiber present. Only the blanket/prime/1st’s are suitable for yarn processing. We DO NOT process leg or belly fiber. Remove all muddy and/or poopy fiber, as the washing does not remove mud or poop. Remove fiber with excessive vegetation. If it crunches, toss it out. Alpaca cria fleeces: In order to make the best yarn from these fleeces, keep the fleeces clean. It is very difficult to remove vegetation from cria fleeces. We suggest shearing the cria by the time they are 1 month old. If this is not possible, cover the fleece (i.e., Rocky sheep coats) over the winter and spring. Each animal usually requires 2 to 3 different sized coats but will last for many years and can be reused. Cria fleeces will be dehaired prior to carding if they were not shorn around 1 month old as this removes dead tips. Keep nail/hoof trimmings away from fiber. If nail or hoof bits are found in the fiber, fiber will be returned. Wait to do the trimming until the fiber has been collected. Sweep area after each animal. Please fill out a separate order form for each lot. For information regarding blending fiber options please explore Ashland Bay and Foxglove Fibers. We will communicate via email with you during the time your fiber is with us. Please respond to our questions to ensure timely processing. Upon receipt, your fiber will be evaluated for staple length, vegetation and cleanliness. You ‘order’ will be added to the production calendar, given an approximate completion date (approximately 6 months from when the fiber ARRIVES at the mill) and an estimate of processing cost. 50% deposit required prior to the start of processing. Upon completion of your order we will send you a final invoice. Note to customers: Outstanding accounts will be assessed a 5% charge on any balance due over 30 days and for each additional 30-day period the account goes unpaid. Fiber/yarn from accounts unpaid after 30 days will become the property of Sallie's Fen Fibers LLC. After the fiber arrives at the mill, all fiber will be washed in-house. Then, depending on the desired final product and order form specifications, the fiber will proceed through some or all of the following processes on the flow chart below. Please refer to Belfast Minimills (follow the link below in Contact Us) for details on each machine. Dehairing: Our fiber separator improves the "Comfort Factor" of your product significantly! It achieves this by removing prickly guard hair, as well as most vegetation and short "second cuts". Loss can vary from less than 10% to as much as 50% depending on the quality and cleanliness of your fiber, but you end up with a much more skin-friendly and valuable result. The mill store is open by appointment only except for the weekends following Thanksgiving and until Christmas.